Plas Glyn y Weddw was built in 1857 as a dower house for Lady Elizabeth Love Jones Parry, widow of Sir Love Parry Jones Parry, esquire of the Madryn estate. Although Lady Jones Parry built the mansion intending it to become her home when her eldest son, Thomas Love Duncombe Jones Parry married, due to the fact that he didn’t marry during her lifetime, she remained living at Madryn until her death in 1881. About £20,000 was spent on developing the mansion, gardens and footpaths, a considerable amount of money in those days. The house was designed by Irish architect Henry Kennedy with a remit of displaying Lady Love's extensive collection of art work. The trails leading through the garden and woodland, known as ‘Winllan’ and all the land in front of the mansion towards the seashore were sheltered by many exotic tree species, including the Giant Sequoia near the entrance of the present day car park, which is by today the tallest tree on the peninsula. Although Lady Jones Parry didn’t live at Glyn y Weddw she visited regularly, driven from Madryn by her coachman, Charles, who wore a top hat and the family’s uniform. William Jones the gardener and his family lived at the rear wing, keeping the house and grounds in order for Lady Jones Parry. During the period following Lady Jones Parry’s death, it was her son Sir Thomas Love Duncombe Jones Parry who owned Plas Glyn y Weddw. He was a prominent and often colourful figure in Caernarfonshire, not only being one of the main landowners but also the Liberal MP for the borough for a period from 1868. He was later made a Baronet and was one of the founders of the Welsh settlement at Patagonia. 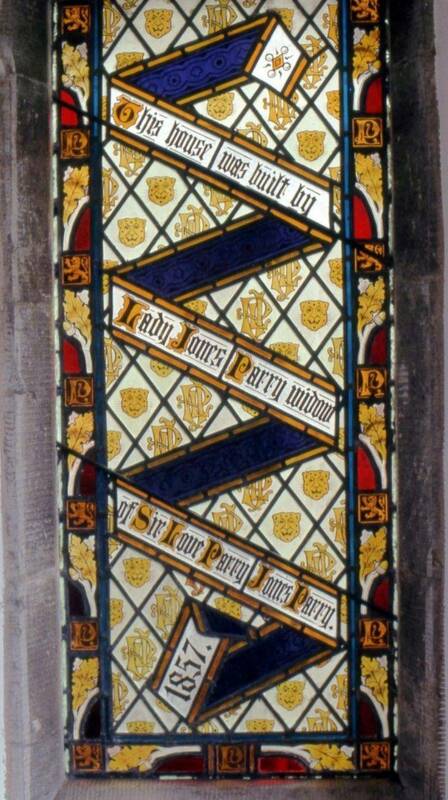 Sir Love Jones Parry lived at Madryn, although he travelled extensively, and spent a lot of his time in London. For a few months during the 1880’s William Rathbone, Liberal MP for Caernarfonshre lived at Plas Glyn y Weddw. Soon afterwards the house and gardens were leased to William Nettleship Angerstein and his family. WN Angerstein died in 1892, and his widow, Frances Augusta (nee Hoare) lived at the mansion until the mid 1890's. Gravestones belonging to the family dogs can be seen on the lower terrace of the front garden. Sir Thomas Duncombe Love Jones Parry died in 1891 and the estate was left to his sister, Sarah Elizabeth Margaret Jones Williams of Gelliwig. Plas Glyn-y-Weddw was sold by auction in 1896 to Solomon Andrews, a Cardiff businessman. Following Sarah Jones Williams' death in 1899 their cousin, William Corbet Yale of Bryn Eglwys, Denbighshire inherited the remainder of the Madryn Estate. He died in 1909 and subsequently the estate, including Madryn Castle were sold. Madryn Castle was demolished during the early 1960's and all that remains today is the Tudor Gatehouse which is situated in the middle of a caravan park.